Goldblatt original wet tape Banjo is the drywall tapers best friend, holding up to a 500' roll of drywall tape and enough compound to tape 40' between fills. No more applying joint compound with a knife and then applying the joint tape, the Banjo does both at once. The wet-tape style allows the tape to be saturated with compound since it is loaded in the same chamber as the drywall compound. Easy thumb screw adjustable valve in the front controls how much compound is applied. 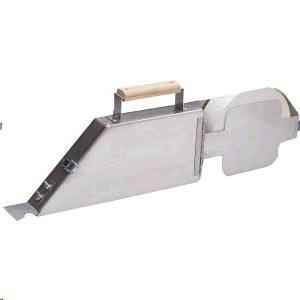 * Please call us with any questions you may hav about our sheetrock taper banjo rentals in Wayzata MN and the Western suburbs of Minneapolis.